So, here we are! after a long development, i finally can release my last game, Knights & Dragons: The Endless Quest. I've always liked the "journey" more than the destination, and the journey-themed games with branches that lead you to different paths have always intrigued me; So i was wondering on the addition of a map system like this since the development of my old castlevania demo, and after going through two other quick games (Final Fight Gold and Golden Axe Legend) to experiment other small things, i've decided to start the development of this one, using once again the simple core mechanics of the 90' fantasy capcom games and the feeling of the old TSR Dungeons & Dragons roleplaying game that i love so much, but this time adding a rich map system full of quests to choose from, to give it the feeling of an Open-world game to explore, where you can go wherever you want and do whatever you want. in the beginning i was thinking of using the main characters from the two capcom D&D arcade games (i will still use them someday, maybe for the sequel of the first Knights and Dragons, since i've ripped a lot of things from those games), but then i've decided to re-use (even if i've ripped almost everything from scratch again) the main characters from two of my favourite capcom games of all times (King of Dragons and Knights of the Round) because i think that those beautiful sprites have still a lot to say, and the feeling they give to me is still strong. So, in a way this game can be considered like a sort of spinoff from my first K&D game. the map system and the unlock system (i will never stop thanking Bloodbane, for helping me develop it so much better with the scripts) allows you to feel like you're playing a different game everytime, and there are so many quests' combinations that every time you play it will be different from the last! furthermore, the soundtrack i've choosen this time is really epic and immersive and i think it fits perfect with the game. In the process, the game has become more and more complicated than like it was intended in the beginning, and i've immersed myself so much in its development, but in the end i'm very happy with the final result, and i hope you too will! - first of all, learn how to block! It works like the old capcom games (behind + attack button at the same time). You can even block right after you've been hit, if you are still on foots, to prevent further damage. Learning the right timing is essential and VITAL in the advanced and difficult quests. Once you will be able to master it, the game will become more easy for you! practice is the key. - explore carefully the map before embarking in a quest: maybe sometimes there are green quests left that you have to complete before unlocking a yellow one, and the same can apply with blue and red quests. so try to complete as many easy quest as you can, before embarking in the more difficult ones: remember that you start with ONE life only (and in order to gain another one, you have to store 5000 xp), and while the green quests are very easy, the other colors are NOT! in total, there are 12 easy quests (green ones, spawning from the beginning of the game), 9 medium quests (yellow ones, you have to complete a set of specific green quests to unlock each of them on the map), 6 blue quests (hard ones, same morking, only you have to complete the yellow quests), and 3 final quests (red, you have to complete the blue ones) for a total of 30 different quests! try to beat them all, if you can! - you can always visit a tavern (gray markers on the map, you unlock one everytime you finish a green quest) before embarking on a new quest, in order to refill your energy. Available from the beginning of the game. Easy to master and unleash big damage. he recover MP slowly, though. his oil flasks remain on the terrain for a while. Available from the beginning of the game. His spell are powerful and spectacular and he's the fastest in recovering MP. with the right timing, you can cancel and combo the tornado, fireball and lightning bolt spells (in this order) for huge damage. 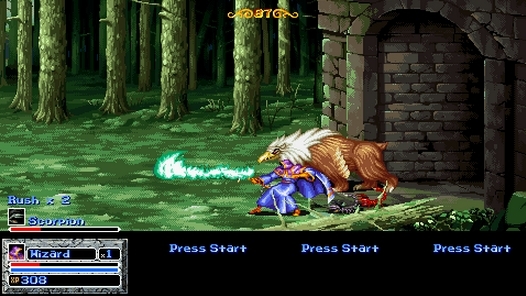 Available from the beginning of the game. A support character, almost indispensable if there are more than 1 player. his healing spells are some of the most useful special moves of the game, and he can paralize opponents too, allow the other players to hit them for free. Available from the beginning of the game. A sneaky character, the fastest in the game, but he has few HP. he has long reach with his knives too. his spark bag special move stay on the terrain and damage the enemies near it. Available from the beginning of the game. The more resistent of the group, he has a lot of HP. he's slow but hit hard, and his trowing axe has a good reach too. he can roll on himself for multiple hits with final ice damage. Available from the beginning of the game. Perfect for players who like to hit enemies from distance, his arrows have the longest reach. his magic is very useful too; he can polymorph the enemies, so that the other chars can hit them for free. his magic missile can hit the enemies wherever they are on the screen. Complete all the GREEN quests to unlock him. Half support, half tank. he can heal himself and the others, like the cleric, and he can also hit very hard and has a good reach with his striking multiple hits attack. Complete all the GREEN quests to unlock him. Strong and fast, all together, but he's the weakest to block. he can become even faster with his berserker rage move, although in this state he can't recover MP and, most important, can't block at all. you can return to the normal state performing the move again (or if you are hit by an enemy!). Complete all the GREEN quests to unlock him. Another useful support character. he can exploit his invisibility spell to arrive unscathed near the other players, and heal them all with his healing spell. Complete all the YELLOW quests to unlock him. The all-round character for excellence. strong in every skill, he can summon merlin with the power of fire. Complete all the YELLOW quests to unlock him. He's very fast. he can summon Merlin with the power of lightning. Complete all the YELLOW quests to unlock him. He's very strong. he can summon Merlin with the power of earthquake. Complete all the BLUE quests to unlock him. The strongest character of all. use him if you want to go through the game in "easy" mode. Complete all the BLUE quests to unlock him. Quite the reverse of Mordred, he is the weakest character of all. use him if you want to go through the game in "hard" mode. - once you finish the game for the first time, you'll gain the option to restart it with all chars unlocked from the beginning! anyway you will find other useful informations (like the special moves combinations for all characters) selecting the HOW TO PLAY option in the main menu of the game, so read it! Wow, what a wall of text i've wrote! i'm sorry, and please excuse my english, it is not my mother language but i hope you can understand it anyway. Enough talk! please enjoy the game, and let me know what you think about it! - fixed the thief invisibility special move, now it correctly cost 55 mp. 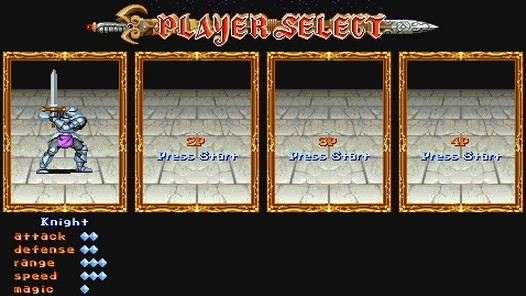 - fixed the initial stage of arcade modes, now the magic staffs spawned will be equal to the initial number of players. - fixed some mistakes in the moveset lists. - fixed enemies magic missiles, now it last 1 second on screen instead of 2 seconds. 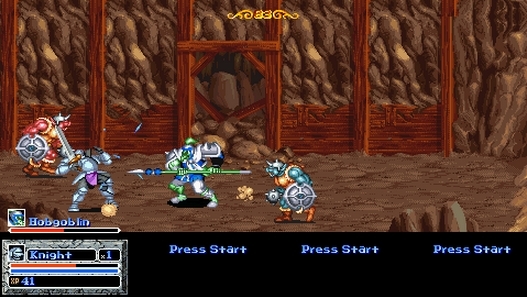 - added a new attack while on horse to hit enemies behind (simply press attack button with left direction pressed). - fixed the cleric heartquake special move, now it correctly cost 60 mp. - fixed arpy and pterodactil bboxes during attacks. - fixed Arthur, Lancelot and Perceval special moves involving Merlin. - fixed the missing initial stage in "The Arcade Quest: The Tower of Doom" and "The Arcade Quest: Shadow over Karameikos". - fixed sahuagin enemies, now they can be hit repeatedly. - fixed Wizard's Meteor Storm spell, now it can't be blocked by enemies. Knights & Dragons: The Endless Quest 3.3 NEWEST!